What is the deciding factor that motivates you to fly away from your home for surgery in Cancún? Away from your bed, your pets and in my case the people I care about the most in the world. In most cases it is the excessive cost of plastic surgery in Canada. In my case part of my surgery was to be covered by our government, but of course I had to wait. “I’m in pain” “you have to wait” “I cannot perform my job properly” “you have to wait”. If you are covered, even partially, you have to wait a year, maybe more because cancer patients and emergencies take priority, as they should. So now I try to pay for it to have it done soon so I will not be in pain, so I can function and live my life. They pass me the invoice and I reel in shock. I can’t afford it, I am stuck. So I google and find My Medical Vacations and Katie Lyna’s responds. She promptly sends me information on what I am inquiring about. She checks availability on some dates I have requested and confirms pricing for the procedure. My partial required payment at home is still more than the full procedure price in Cancún. I feel some hope, stress is lifted, and I imagine that might possibly be something I can do. I send my deposit to Katie and feel absolutely certain I have made the right decision. Next I am introduced next to Betty Corona –Head Patient Concierge- She is professional and organized, confident and of course very friendly. 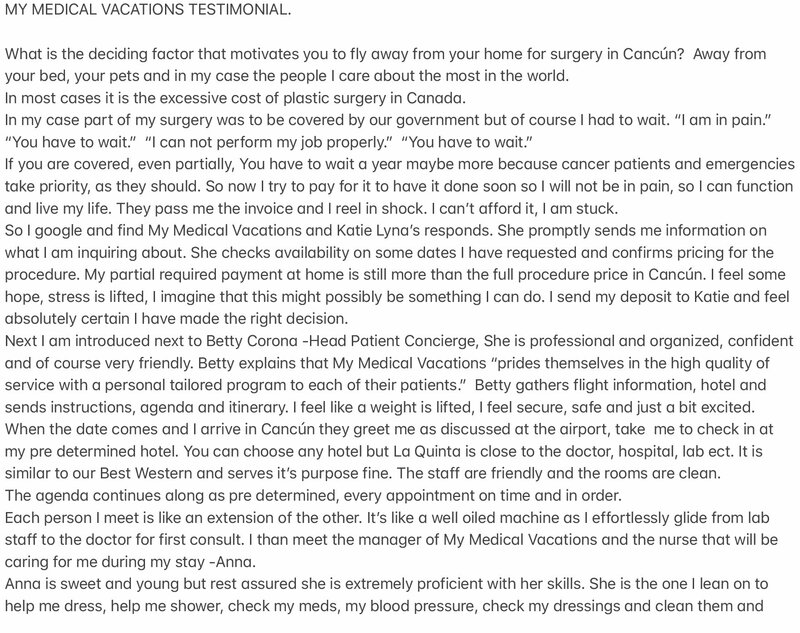 Betty explains that My Medical Vacations “prides themselves in the high quality service with a personal, tailored program to each of their patients” Betty gathers flight information, hotel and send instructions, agenda and itinerary. I feel like a weight is lifted, I feel secure, safe and just a bit excited. When the date comes and I arrive in Cancún they greet me as discussed at the airport. Take me to check in at my pre-determined hotel. You can choose any hotel, but La Quinta is closed to the doctor, hospital, lab, etc. It is similar to our Best Western and serves its purpose fine. The staff is friendly and the rooms are clean. The agenda continues along as predetermines, every appointment on time and in order. Each person I meet is like an extension of the other. It’s like a well-oiled machine as I effortlessly glide from lab staff to the doctor for first consult. 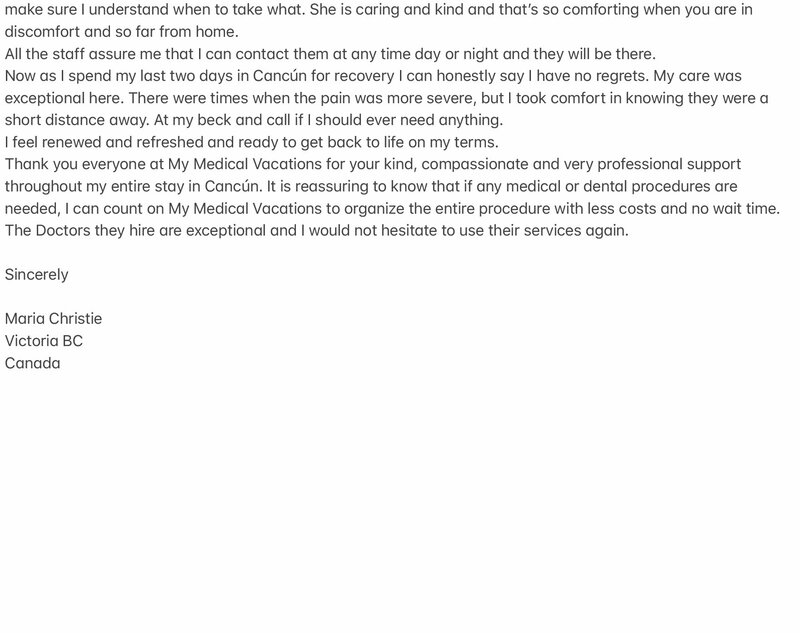 I then meet the manager of My Medical Vacation and the nurse that will be caring for me during my stay-Anna. Anna is sweet and young, but rest assured she is extremely proficient with her skills. She is the one I lean on to help me dress, help me shower, check my MEDs, my blood pressure, check my dressings and clean them and make sure I understand when to take what. She is caring and kind and so comforting when you are in discomfort and so far from home. All the staff assures me that I can contact them at any time day or night and they will be there. Now, as I spend my last two days in Cancún for recovery I can honestly say I have no regrets. My car was exceptional here. There were times the pain was more severe, but I took comfort in knowing they were a short distance away. At my back and call if I should ever need anything. I feel renewed and refreshed and ready to get back to life on my terms.Thank you everyone at My Medical Vacations for your kind, compassionate and very professional support throughout my entire stay in Cancún. It is reassuring to know that if any, medical or dental procedure is needed, I can count on My Medical Vacations to organize the entire procedure with less costs and no wait time.The doctor they hire are exceptional and I would not hesitate to use their services again.